Women Empowered | I can do ALL things through Christ who strengthens me! 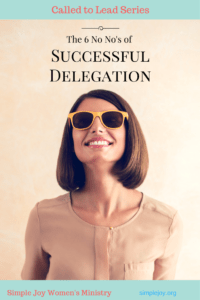 The 6 No-no’s of Successful Delegation Part 6: Never Forget to Say Thank You! I hate sounding like everyone’s mom but you must never, EVER forget your manners. Whether you are overseeing an event or an organization, working with volunteers or high paid professionals, you must ALWAYS REMEMBER TO SAY THANK YOU! This is vitally important when you are working with volunteers. Most volunteers work hard for no pay. Many if not most do the work out because they feel called to serve. However, everyone wants to know their hard work is appreciated. Too often, once an event or term (for those serving on a board or committee) is over, the leader walks away, musing over the great job THEY did. Yes, they did do a great job, with a lot of help. You simply must show your appreciation. At the very least, send a handwritten note thanking each volunteer. Yes, handwritten. They put in a lot of time. The least you can do is take some time to write a brief not thanking each & everyone of your helpers for they contribution to making your event, year, organization, etc a success. If you are able, you might give each person a small gift to thank them. It doesn’t have to be expensive. It can even be something you made. You just need to let them know you really appreciate how hard they worked & how good they made you look! Take my word for it, you will have an easier time gathering volunteers for your next endeavor if you treat your current volunteers like royalty. So, what if they are employees. I mean, after all, they’re getting PAID aren’t they? Why should I have to say “thank you” when they are simply doing their job? Well, first off, if all you want them to do is the barest minimum required, then go ahead & refuse to thank them. Before you do that though, you should understand the hierarchy of needs. I’m not going to teach the entire structure but I am going to share the short version. Maslow’s hierarchy is a motivational theory. At the bottom, people are working for basic needs. On the next step, they are working for their safety. If you want people that are going to give more than expected, then you need to show your appreciation. People higher on that hierarchy seek to belong, to strengthen their self esteem. On the final level, people seek personal growth & fulfillment. Once you get past the first two levels, pay is not the motivator. While those people like appreciation, they prefer something more substantial. While the people on the top 3 levels like monetary rewards, they need more in order to be satisfied with their position. You MUST let them know you not only see the great job they are doing, you also appreciate THEM! It’s not just about the job, it’s about them! Now you might think the idea of thanking people is outdated. WERE YOU RAISED IN A CAVE? Good manners are NEVER outdated. Good manners help you know you are always doing the right thing. Now, if saying thank you makes you uncomfortable because no one else in the organization acts that way, in other words, like a civilized human being, then TOUGH! If you want to be a leader, you must do the things no one else is willing or able to do. A leader must be willing to blaze a trail, even if it means clearing an old, little used trail, THEN DO IT! Otherwise, you are simply a follower! Is that what you really want! It takes so little to show people that you appreciate them. Yet the rewards for them AND YOU are tremendous. I have a confession to make, well, actually 2 confessions: I am borderline OCD & I struggle with anxiety. Both conditions are mild & only cause me slight problems. My darling husband, the Infamous Mr. D is so wonderful about all this. I once apologized for being so fussy about something. He told me I wasn’t fussy. I simply like things a certain way. Why shouldn’t I insist they be that way if that’s what I want? While this attitude of wanting things MY way may work well at home & with family, it doesn’t always fly when serving as a leader. An effective leader must surrender control to those assigned tasks & trust they will do an incredible job with their assignment. Easier said than done! When we are given the responsibility for an event, project, etc., we often begin with a vision of the end result. After all, leaders tend to be visionaries so this is only natural. Then we do our best to share that vision with our team, allowing for them to adapt the vision to fit their gifts & talents. We must remember we took the time to do our research, selecting the right people for each task according to their skill set. We must accept the fact the end result may reflect our vision but from a different angle as each member of the team applies their perception of the vision. this is when trouble may begin. Sometimes its tough to remember our vision did not come down a mountain craved in stone tablets. Our vision is a living idea that evolves as new people are added to the process. Each person brings their perspective of the vision, making it better, even stronger. However, as the source of origin for the vision, we may have a difficult time accepting any changes to the original. We may believe it was perfect to begin. How dare these charlatans trifle with perfection! Without thinking, it becomes easy to criticize the adaptation to the vision, pointing out perceived flaws & weaknesses. BIG MISTAKE! Unless we want to do EVERYTHING ourselves, we must be able to surrender the vision to members of our team & allow them to adapt their portion as needed. Remember, NO MICROMANAGING! We must hand it over & trust our decision to add them to the team & trust their ability to do the job efficiently & creatively. When someone has changed my vision, I have had to take a breath before speaking. I say something pleasant without committing myself until I have time to consider the changes. Once I take a step back, I usually find I like the things that have been changed, added, subtracted or whatever. The ideas brought to the vision by others have only strengthened the original, not weakened it. If I do find their changes just won’t work for whatever reason, I gently point this out & begin a discussion on ways to make the improvements that will work. No one likes to admit their idea wasn’t just brilliant but also perfect the way it began. Let’s face it, though, even a genius idea like the incandescent lightbulb took thousands & thousands of tries before Edison arrived at the perfect combination of materials that worked. Be open to improvement & never give up! In the last post in this series, I warned you about the problems with micromanaging the people helping you in your organization or with your event. If an individual has never been responsible for anything before, you may intimidate or discourage them if you watch them too closely. If they are experienced, they may be insulted by you questioning them. You may think you’re helping but you might cause more problems than you prevent. Now I am going to appear to contradict myself. While you never want to constantly question the people helping you, you must ALWAYS check in with them on a regular basis. There is a very broad line between micromanaging people & abandoning them! Unfortunately, too many “leaders” go to one extreme or another. I’ve already discussed micromanagement. Let’s talk about abandonment. You must never assume everything flows smoothly even if you have the most experienced people helping you. Things happen. Obstacles pop up. And if you are an effective leader, not all your workers are going to be experienced. For some, this may be their first time running ANYTHING. It is important to give new people an opportunity to learn ways to serve but you can’t simply throw them in the water & encourage them to swim. While some people will call for help, others, out of embarrassment will drown quietly in the overwhelming tasks. Rather than working to create a new worker & potential leader, you might create a FORMER member of your group! While you never want to stare over someone’s shoulder, regardless of their experience level, you do need to check in with everyone on a regular basis. Ask them how things are going. Ask if they need anything. Ask if there is anything you can do to help them. Assure them you are a,ways available if they need anything, anything at all. It is vitally important you never assume all is well just because you aren’t hearing any complaints. Every mom knows when things are too quiet, she needs to check on the kids to see what is happening… & it usually isn’t good! Let your people do things their way without you hovering while giving them the support they need to succeed. THAT is something the entire team should be able to assume! As a first time leader, you want to do a good job. No, you want to do a GREAT job! You’re concerned it might reflect badly on you if something goes wrong, whether you are in charge of an event or an organization. Your name & face are what people see & you are going to do everything in your power to make certain everything goes RIGHT! Unfortunately, this often leads to micromanaging every aspect of of your event or organization. Nothing is going to slip through the cracks on your watch. Nothing, that is, except all those wonderful workers helping you. Workers who get tired very quickly of having every task & decision second guessed by their Fearful Leader! Managers need to dot every I & cross every T. Leaders need to have faith their workers are taking care of the I’s & T’s. For this reason, leaders must do their work before assigning tasks to others. They must create a list of all the things that need to be done or positions to be filled. Leaders must then study the people in their potential worker pool, matching the best people (based on their gifts & talents) with tasks or positions. While everyone may not be a “perfect” fit, you should match them up as closely as possible, allowing room for growth. I believe a vital part of leadership is helping others grow. Growth gives individuals a sense of pride & accomplishment while increasing your worker pool. Once you have people in place, let them do their job. Check with them regularly in case they need something. Let them know you are always available should they have questions or need help. Otherwise, LEAVE THEM ALONE! Talented workers become frustrated when someone is constantly staring over their shoulder. It implies you have no faith in their ability. If they are an experienced worker, they will resent this implication. If they are a new worker, just learning how to apply their talents, they will become insecure, questioning their ability to do the job correctly. In either case, you have cost yourself time & talent. In addition, word will get out that you are NOT the one people want to work with on any event or in any organization. Take a breath, stand back & let people do the job they are qualified to do. In the long run, this technique makes things much less stressful for everyone! Time to Stop Talking & Take Action! Harassed & helpless! Boy, do I know that feeling! I watch the news & read the paper & begin to wonder if there IS any hope. I read the posts on Facebook from other moms, other women & I know I’m not alone. So many women seem frightened, hopeless, helpless. We all begin to wonder if there is ANYTHING we can do to make things better. Things seem to be getting worse everyday. I get angry and resolved to take action. Unfortunately, I let other things get in my way. I knew God was calling me & instead, I let trivial matter distract me. Not anymore! I’m not here to discuss political issues or constitutional rights. I believe this goes deeper than any of that. No, I’m want to look at this from my expert perspective. And my area of expertise is Theology. When I was a kid, people said, “Everyone always talks about the weather but no one ever does anything about it!” Well, there isn’t much we can do about the weather. And while many of us TALK about conditions in our nation, our cities, our neighborhoods, there IS something we can do about it. In the verse above from the Gospel of Matthew, Jesus felt compassion for the people because there were lost & afraid “like sheep without a shepherd.” We act like frighten sheep. We run around in a panic. Fortunately, we HAVE a Shepherd. Jesus is watching over us, protecting us whether we realize it or not. So the first thing we can do it put our faith in Him. The second thing we can do is find strength, hope & comfort in Scripture. When life seems overwhelming, when we are unable to find answers, I know we can ALWAYS find the answers we need in the Bible. The third thing we can do is PRAY! There is power in prayer. I also believe there is incredible power when WOMEN pray. More important, powerful things happen when women come together to pray. Jesus told us when 2 or more are gathered in my name, I will be there. Oh, He’s always there with us as individuals but when 2 or more of us come together to pray, Jesus is right there with us, praying beside us & personally taking our concerns to His Father. In light of these three things, I came to the realization there is even more we can do. For a very long time now, I have felt God filling me with a vision. God has been calling me to create a ministry for women. A ministry made up of small groups of women, meeting in homes across the country, sharing faith, studying Scripture, praying, strengthening & supporting one another & having fun! The problem I had was how to do this? I have dragged my feet long enough. I can’t worry anymore about the right way to begin, the right time to start, the right pice of the puzzle to fall into my lap. I’m just going to begin. If you look at the top of the page in the menu, you’ll see Sisters of Simple Joy. This is the name I have given to our small group women’s ministry. Beneath that, I am adding information to help you launch your own group. There is no charge for any of this. I have created a workbook for group leaders. Anyway, you can find information at the top. For now, pray. God is calling a small group of women to be the first small group leaders in this ministry. I’m not naming any names. That’s not for me to decide. I’m not saying anyone should do anything right now. Just pray. If you are one of the women God has chosen, He’ll let you know. All I ask is that you open your heart, mind & spirit to His leading! And should you decide to join this adventure, let me know. I want to create a network of praying faithful women that uphold & support one another, their families, their communities & our nation. In the last post, I wanted you to understand why you shouldn’t do it yourself. You CAN help out but as the leader, your job it to oversee the work being done, offering encouragement & guidance. In this post, I’m going to tell you something you may not believe & then appear to thoroughly contradict myself! This doesn’t mean you won’t NEED volunteers. However, the least effective way of recruiting help for your group or event is by making a public plea for volunteers. We’ve all seen it. Sitting in church on Sunday morning when some poor shlub has to stand in front of the congregation to ask for help. Sometimes, they are almost on the knees pleading for someone, anyone to volunteer. Why doesn’t this work? First, EVERYBODY is busy. They are all sitting there listing the things they have to do that prevent them from helping out. Second, everybody assumes someone else will do it. Finally, people like to be asked! The big fundraiser at my church is an event I had led for the last 4 years. When the new women’s ministry was created, I turned the event over to them. I began hearing there were problems within the group & it looked like the fundraiser would be cancelled. You might wonder why I didn’t volunteer to help out. Simple! No one asked me. Now, this isn’t a matter of hurt feelings or being a mean. When no one asked, I assumed they had a different way they wanted to do things. A new group was in charge. I stepped back & let them run it the way they saw fit. People like to be asked! It shows them you specifically want them to help do a certain task. It shows you feel they have the qualifications to handle the job. It also allows you to overcome any objections they may have. “Yes, everyone is very busy. That’s why we are dividing the event up into smaller parts so no one is overwhelmed by a large time commitment!” Ask them face to face & your level of success increases greatly! A final note: Henrietta Mears, late director of Christian Education at Hollywood Presbyterian Church & founder of Gospel Light Publishing always advised against a pulpit call for volunteers. She noted this seemed to be the most popular way to recruit Sunday School teachers. Even back when she was running a very large Sunday School that had multiple classrooms for each grade, she never did a pulpit request for teachers. She felt this often attracted the wrong people to the job. Not that you would get terrible people, just people with their own agendas. Often, individuals volunteer to oversee something in an organization because they believe THEY can run it better. “I know how this should be done & this is my chance to show them how they SHOULD be doing it!” This brings on more headaches than it cures. You may also have situations where people volunteer to help because the volunteering is what gives them the warm fuzzy feeling. Unfortunately, they have no aptitude when it comes to follow through. Determine what needs to be done, the skills needed to do, then ask people qualified to do the job. Putting in time at the beginning saves you time, & pain, later! How do YOU ask people to help with an event? What problems have you had when you call for volunteers? I enjoy attending & teaching bible studies at my church. However, I enjoy Bible studies that are hosted in a private home even more. The tradition of sharing the Word of God goes back to the first church in Jerusalem, when Christians met in the homes of members. Meeting in homes allowed the group members to worship in a more intimate & relaxed environment, sharing prayer & fellowship in a place that welcomed everyone. Today, there are many women seeking to draw closer to God that might never attend a Bible study at a church. There are a variety of reasons for this & I am not going to discuss them right now. 🙂 Let’s just accept the fact that an in-home Bible study might be more inviting to some of your friends, neighbors & family. I know the thought of hosting an in-home Bible study may seem overwhelming. It doesn’t have to be. First, you don’t have to do everything yourself. But, more of that later. for this post, I just want to share the ingredients that go into hosting your Bible study. follow this recipe & you are on your way to having “tasty” event each & every time! Acts 2:42: They devoted themselves to the apostles’ teaching and fellowship, to the breaking of bread and the prayers. Just like the ingredients in a recipe, it is important to add each of these 5 ingredients to all your Bible studies. Whether it’s your regular study or an open house to introduce potential group members, be sure to add all 5 ingredients to prevent your event from falling flat! Your gatherings are faith-based. Begin with prayer, share your lesson, have discussion. Your group lacks strength without faith. Always remember how important family is to your group members. Show ways the day’s lesson relates to the family. Renewing women, recharging women, strengthening women helps improve the quality of their family life. Your gatherings are also a time to share with one another. Discuss events in your lives. Ask about family members. Fellowship allows each of you to draw nearer to one another. Fellowship strengthens faith & make the discussion during Bible study more intimate & powerful. Everyone relaxes more when they share food. Eating together is another way to become closer as a group. Be sure to have refreshments when you get together. What would your group be without fun? Short-lived, I imagine! Faith doesn’t have to be dull. Schedule fun during your gatherings & at other times during the month. Each of you needs to see your gatherings as CELEBRATIONS!